Control of the unit operation mode is performed by means of sensor control panel located on the unit casing or a remote controller. Low voltage (12V) power supply between control panel and VENTO Eco2 units. 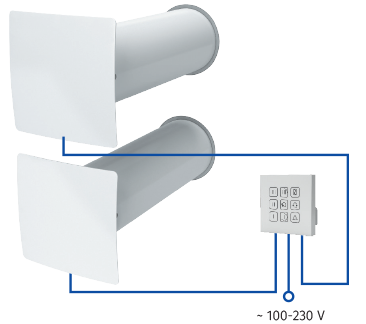 The unit is designed for through-the-wall installation inside a prepared hole in an outer wall of the building.VENTO Eco2 A50 allows arranging the most efficient balanced ventilation. Two units, connected to a common control panel, operate in reverse phases. 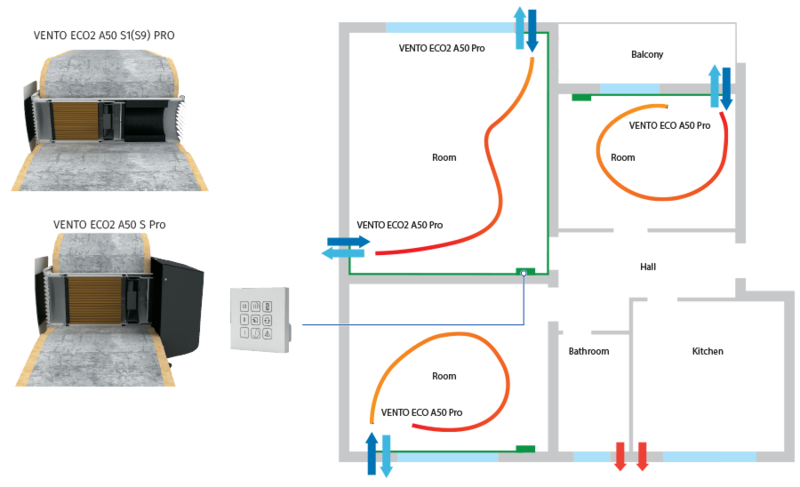 One unit ensures supply of fresh air to the room and the other unit provides air extract from the premise. In regeneration mode units change direction of air flow to opposite one every 70 seconds. One unit is able to ventilate a room up to 25 m2. For bigger rooms two or more units must be installed.